US spending on corporate training grew by 15% last year (the highest growth rate in seven years) to over $70 Billion in the US and over $130 Billion worldwide. The majority of that training changes how an employee operates or communicates for the first week – and does not have a lasting effect beyond a 30 day shelf life. This is because most training waits for an ‘ah-ha!’ moment to occur in the employee. They hope that the employee ‘get’s in’ quickly, and can pivot to make an effective change for themselves. Changing a practice or habit can be neigh impossible. It takes effort, and it takes practice turned to discipline turned to second nature of a new habit. IMPROVMINDSET can provide an experiential learning session, providing employees with active learning of new habits, awareness of habitual practices, and tools to creating a change in how employees work to be more inclusive, accepting and innovative in their positions. Q: WILL THIS TRAINING BE EMBARRASSING? A: Absolutely not! Most clients perceive it will be scary or difficult, and find that it is very inclusive of all learning styles and doesn't make anyone feel uncomfortable. Q: WILL I HAVE TO STAND IN FRONT OF PEOPLE AND MAKE JOKES? A: No! The basis of Improv is about making your partner on stage look good - it is an external focus. It is not about being in the spotlight or making jokes. Our core tenet is about supporting your team, building consensus, and working together. Q: HOW WILL THE INTROVERTS IN THE GROUP LIKE IT? A: We spend at least 45 minutes creating 'buy in' for all participants. In the 20+ years of trainings, we have never had a person opt out after that time. Most people are more afraid of the idea then they are of the reality of what the workshop entails. IMPROVMINDSET is a corporate education company that provides training and materials that engage participants and inspire long-lasting results. 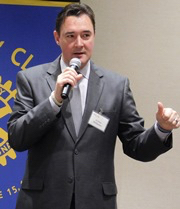 Andrew McMasters, CEO of IMPROVMINDSET and certified AI Trainer, is an international leader in coaching, training and consulting to organizations and individuals in the areas of communication, team building, leadership, executive presence and organizational change using the technique of experiential learning. The one thing IMS can provide for you above other companies is experience. We have been working with corporate clients for over 20 years, and have been doing applied trainings for clients for over 30. Our trainers are experienced professionals, and practicing artists. This is our market differentiation verses other organizations that provide corporate education for business. as well as a Certificate in Arts Management, University of Washington. the ability to bring real life context and practical experience to every workshop. Andrew's customized trainings will get your team working together, laughing, and understanding how they can be more effective and productive. With a team of professional artists, facilitators, mediators and experts, these workshops will quickly tap into your organization’s business knowledge and provide the tools and resources you need to produce results driven innovation. Each workshop fuses exercises and concepts with instant applications to the workplace, creating fun and relevant experiences for your entire team. Your employees will benefit from increased confidence, heightened communication and leadership skills. The workshops are interactive, engaging, and hands-on. 'Yes, and' - a lesson for accepting and building on offers. Everyday people give you offers. When we are stuck in our own ideas or preconceived notions, we can't accept these ideas as 'offers' or a new ideas. Practicing 'Yes, and' helps us to recognize when new ideas are presented, how we react to them, and then how we can use them to build something better than what we imagined. It is an active tool for business to build consensus and inclusion (see the post on 'What's under the Van. '), and bring people together in a shared vision. As a leader, the skills inherent in Improvisation are essential to your success. ImprovMindset can help you use the skills of trained actors to motivate your staff and bring them into your vision to effectively LEAD. It doesn’t take years to master - the exercises and workshops are made to demystify the magic that makes people listen and connect to a vision or goal, and bring their full selves to work. Find out what the power of 'Yes, and' can do for your team! Email us today. Workshops are varied based on your organization's need, time frame and goals. They range in length from one-day three-hour initial sessions, to ongoing training that can provide your company with a weekly or monthly activities to ensure your team effectively changes how it communicates (effectively increasing your bottom line). Innovation and Changing your company's ROI with two words. If you were going to run a marathon, would you start out by running 26 miles? Of course not. You would start small, and then train constantly until you were able to run a full marathon. Team Building is the same way. Most organizations provide employees just one or two days of activities a year to help them create a team. Rarely is there any follow up or on-going training to help make the team building successful. ImprovMindset can provide you with a long term solution; exercises and on-going training that can be administered weekly or monthly. This allows your team to address new issues and learn to trust each other more than once or twice a year. The exercises have been created to not have employees competing with each other which causes division and tension. ImprovMindset exercises are based on working together as a team, finding a group cohesion and learning each person's specific responsibilities in their role. Make team building a part of your corporate culture, not just a once-a-year activity. "The team can’t stop talking about how much fun they had, how much they learned, and how it was the best retreat they’ve ever attended. We are working on a few big proposals, and are applying the lessons there too. "Bungie Studios...people had already used the learning in the days after, and how much more they valued it over some other communications training sessions we have received as a group. Again, thanks so much for coming out our way and sharing your insights with us! "We recently had one of our client teams attend a session with Andrew to focus on communication, team building and presentation skills. Our employees were unsure what to expect beforehand. Five minutes into the session, that nervousness disappeared. Andrew quickly and easily creates a safe space for people to participate without being put on the spot, critically think about how to immediately apply the learnings to their team and client work, all while having fun and getting to know their teammates." "The student leadership development committee of SPU cannot thank you enough for not only the professional and powerful content of your presentation, but also for the passionate and gracious way that came onto our campus and delivered a wonderful Key Note address. Your work with tens students was very well received from all ranges of our audience." ​"Andrew provided a thought provoking and fun session for our team along with some practical applications for collaboration and problem solving. As a tight knit team who are always looking at ways to improve our approach and the value we provide our customers this provided some fresh and creative tools for us to use in our daily work and routines." "McMasters is a rock star. Amazing, dynamic session. The presenter brought bright new perspectives and problem solving tools to age-old issues. "International Philanthropy"We laughed hard and learned a lot about how to better communicate and cooperate as a team -- I highly recommend." "...incredible stuff. And the game-ification morning was fantastic..."
Improvisation is a skill that you use every day, in every interaction. It is the unplanned interaction between co-workers, clients or customers. Despite how much we would like to plan, there is no script for these situations. Learn how to use the skills of improvisation to drive your organizations goals and increase your bottom line.